Autumn 2013 witnessed an unprecedented influx of migrant bats into coastal areas of Norfolk. The main movement was associated with an influx of migrant continental birds in classic ‘fall’ conditions: a predominantly easterly airflow from Scandinavia and the Low Countries. A total of 14 bats were recorded flying in-off the sea during a nine-day period in late August with a further single record received from late September. Although the majority of individuals were left unidentified, at least two were confirmed as Nathusius’ Pipistrelle, the most common migrant species to occur in Britain. In contrast with the rest of Europe, bat migrations are poorly known in Britain (e.g. Natural England). Hutterer et al (2005) reviewed ringing data and literature in relation to bat migration in Europe and grouped species into long, medium or short-range migrants. The single longest migration informed by the recovery of a bat was that of 1,905 km undertaken by a Nathusius’ Pipistrelle between Latvia and Croatia. 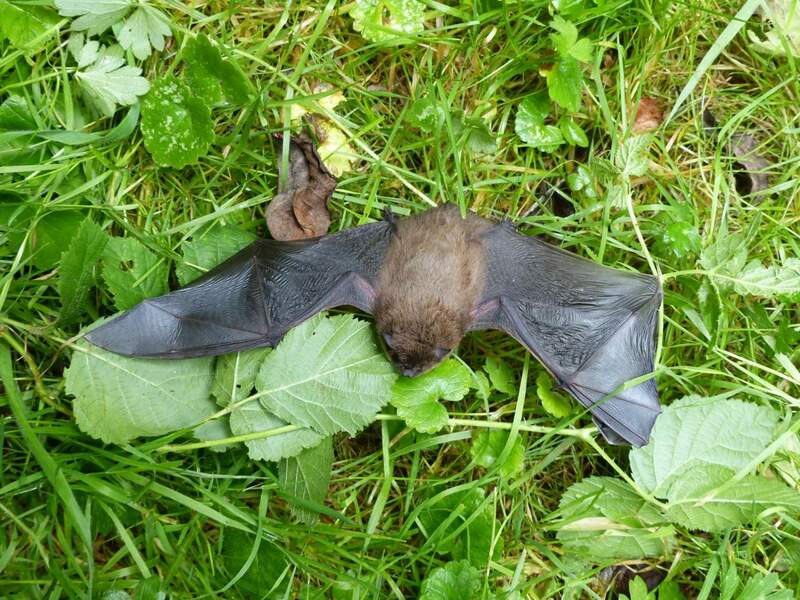 Recently, the first conclusive evidence of a bat moving between the U.K and Continental Europe was provided by a Nathusius’ Pipistrelle that was ringed in north Somerset and found 15 months and 600 km later in Friesland, Netherlands. A further three species fit into the category ‘long distance migrants’ as grouped by Hutterer et al, these being Leisler’s Bat, Noctule and Parti-coloured Bat. All these species, including Nathusius’ Pipistrelle, regularly undertake annual 3,000-4,000 km migrations from the summer breeding areas in northeast Europe to their wintering grounds in central and southwestern Europe. Britain has a long history of migrant/vagrant bats arriving in-off the sea in the autumn, often appearing on usually bat-free islands such as the Shetland and Orkney archipelagos as well as offshore installations in the North Sea. The number of records though is few, and it would seem likely that any seasonal movements are under-recorded and highly variable between years. Records of migrant bats in the ‘Norfolk Bird and Mammal Report (NBMR)’ are similarly few with the Parti-coloured Bat that flew in-off the sea at Kelling and promptly went to roost in a beachside pillbox on 13th September 2008 being perhaps the most famous example. A scour of NBMRs from the previous 40 years has revealed few documented records of any bat species flying in off the sea, with the majority in recent years, and most in mid-September. The autumn 2013 records detailed below were requested via social media, primarily Twitter (https://twitter.com/RDMECOLOGY) and Facebook. Sheringham – a single “large” bat was seen to fly in off the sea at Sheringham during a sea-watching session at 18.00. This constituted the first bat seen arriving in-off the sea by Marcus Nash in “many years of sea-watching”. Blakeney Point – “a medium-sized bat, brown-bodied with obvious but not large ears” was seen by Dr Martin Perrow (no time given). Scolt Head Island – at 08.45 a bat described as being “30% bigger than a pipistrelle with a sandy yellow belly” was initially picked up very far out to sea and upon arriving at Scolt Head Island immediately crash-landed into the marram grass (Neil Lawton). At 09.30 what was presumably the same bat was seen hawking near to where it had initially landed. This could potentially be a Parti-coloured Bat based on the description. Cley-next-the-Sea – a “large” bat was spotted a long way offshore by Geoff Keen and watched as it flew inland at 16.00. Titchwell RSPB reserve – a remarkable total of five probable Nathusius’ Pipistrelles were seen to fly in-off the sea at Titchwell between 09.00 and 10.00 (Paul Eele et al). Some were seen to fly into a pillbox on the beach with one very tired individual even seen crawling across the sand to get into a pillbox! 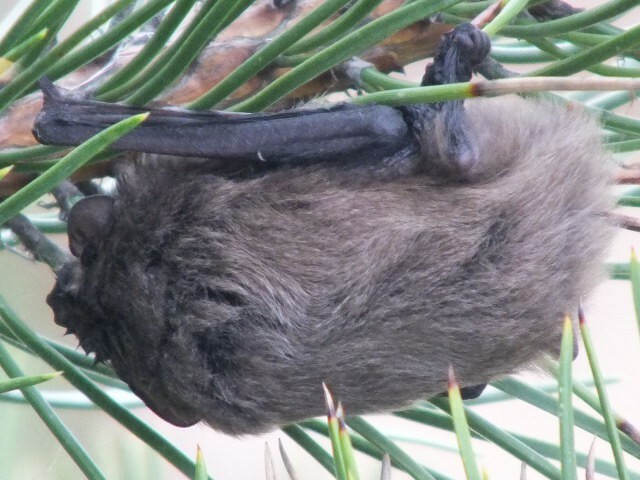 Holme dunes – a single Nathusius’ Pipistrelle was seen to fly in-off the sea by Keith Tinworth at 09.30 and landed in the nearest pine bush to the sea and was still there two hours later (See Figure 1). Trimingham – Gavin Horsley saw a bat fly in-off the sea at Trimingham at 10.00 and suggests it was “bigger than a pipistrelle”. Happisburgh –James Appleton saw a bat, appearing bigger than a pipistrelle, fly over the cliff at around 11.00. Sheringham – Paul Whiteman watched a single bat fly in from the northeast at midday. Though it was always distant to the observer, Paul described it as being “medium-large size”. Kelling Hard – Marcus Nash saw two bats (possibly pipistrelle species) dodging the attentions of gulls as they flew in-off the sea at 09.45. The comments made by a number of seasoned birders suggest that the influx of migrant bats into Norfolk in late August 2013 was unprecedented in its scale. Certainly, the weather conditions appeared ideal for drifting across birds migrating along the continental seaboard of the Low Countries and southern Scandinavia, and the associated influx of migrant bats must surely be associated (see Table 1). The departure points of these bats are open to speculation. Assessing the species composition of the scarce migrant birds recorded in Norfolk during this period does not particularly assist as these actively migrating birds could have been drifted across the North Sea from any point over the sea or between southern Norway and the Netherlands. It appears safe to rule out the possibility that these bats were migrating down the east coast of Britain. Gibraltar Point, Lincolnshire is a mere 22 km across the Wash from Titchwell and would take a pipistrelle less that one hour to make such a journey. An arrival time of between 09.00 and 10.00 as witnessed would have seen these bats taking off from Gibraltar Point in broad daylight, several hours after sunrise, and therefore such a scenario can be discounted with confidence. Theoretical flight calculations by Hedenstrom (2009) suggest a Nathusius’ Pipistrelle could make a direct flight of 675 km in calm weather conditions with an average fuel consumption of 1% of body mass per hour of flight. If such a flight is possible, then bats seen migrating into Norfolk could have departed from any point from southern Norway southwards. Such long-range non-stop flights have not been confirmed but it is clearly not an optimal strategy given that the majority of those hours spent in the air would be during daylight when both the risk of predation, and body mass depletion, is high. However, observations of daytime flying bats in the middle of the North Sea e.g. in the Dogger Bank sea area (e.g. Nick Robinson pers comm), suggests that at least some bats attempt, whether purposefully or otherwise, such a crossing on occasion. Further, bats could be feeding during migration as found by Suba et al (2012) when studying migrating Nathusius’ Pipistrelles along the Baltic Coast of Latvia which adopt a ‘fly-and-forage’ strategy when sufficient prey availability allows. Prey availability over the shallow seas such as the Baltic Sea and North Sea can be high (e.g. Ahlen et al 2007) and so body mass depletion would become less of a factor. The muscles of bats would certainly tire but it is considered likely that this factor would not compromise a single flight across the North Sea. Whilst departure points are difficult to determine, it seems safe to associate the influx into Norfolk with the prevailing weather conditions despite a study of bat records on North Sea installations in the Dutch sector of the North Sea showing no significant correlation between the two (Boshamer & Bekker, 2008). The number of migrant bats recorded in coastal Norfolk during late August 2013, particularly during 25-26th may be related to ideal weather conditions combined with increased observer coverage over the Bank Holiday weekend. Alternatively, or perhaps more likely, in addition to these factors, has an increase in offshore installations caused an increase in the number of records of migrant bats? Certainly, prior to the first maternity colonies of Nathusius’ Pipistrelle in the U.K being found in the late 1990’s, the records of this species suggested strongly that it was a vagrant (Stebbings 1988), prior to it later being considered a migrant winter visitor (e.g Hutson 1993). We now know that it breeds across much of the country, albeit at low density, and though increasing observer coverage and availability of better bat detecting equipment has surely played a major role in increasing our understanding of this species’ status, it is likely that this species was not simply overlooked previously, but that increased immigration has increased its range and consequently it has now gained a real foothold as a species within the UK. Whilst I have discussed the potential for bats to undertake long-distance single flights, this is presumably not an optimal strategy given the potential for predation when flying during daylight and depleting energy budgets. Indeed, Dietz et al (2007) found that Nathusius’ Pipistrelle generally move between 29 and 48 kilometres (up to 80 km) per night during migration whilst Hedenstrom (2009) highlighted how ringing recoveries in Nathusius’ Pipistrelle showed a mean distance of 46 km per day. If bats found themselves over the sea then by necessity they would have to complete longer flights. Alternatively, some bats could be arriving via several hops. 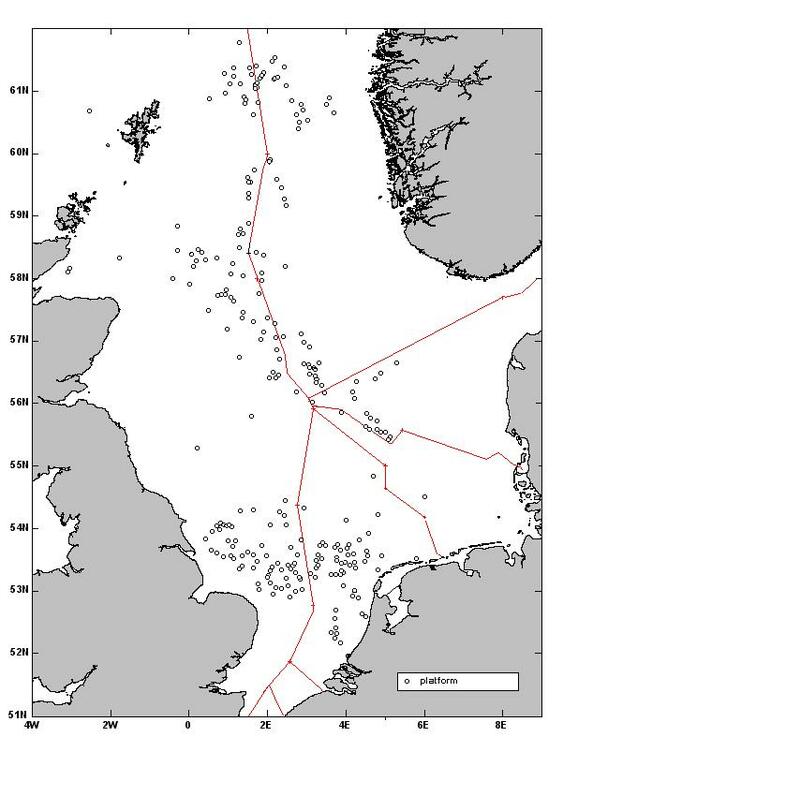 The North Sea is littered with potential roost sites for bats in the form of rigs, various platforms and more recently, wind turbines (see Figure 3) and I consider it likely that the presence of offshore installations is important in enabling migrant bats to get from the Continent to Britain. Boshamer & Bekker (2008) and Ahlen et al (2007) have shown that bats will roost and even perform song-flights from such installations and the North Sea Bird Club have for a long time collated records of bats from such installations, particularly in the northern sector of the North Sea. Boshamer & Bekker (2008) report a total of 34 bats from offshore platforms in the Dutch sector of the North Sea between 1988 and 2007, 18 of which were in autumn and 14 in spring. Of these 34 bats, Nathusius’ Pipistrelles constitute 26 records with Noctule (2x), Northern Bat (2x), Serotine (1x) and Parti-coloured Bat (1x) making up the remainder. The number of bats reported from Dutch North Sea sector platforms has increased every five-year period since the first in 1988. As Figure 2 suggests, a bat could easily make it across the North Sea from the Continent in a series of relatively short hops between offshore installations ensuring flights are only undertaken in the dark when predation risk is low. How frequently such a migration strategy is taken is open to discussion. The average number of bats reported from offshore installations in the Dutch sector of the North Sea equates to just over 1.2 individuals per year over the recording period since the first bat was recorded in 1988. Considering there was a total of 65 offshore platforms (in 2006) in this sea sector, at first glance, this number of bats appears insignificant and suggests that few bats are ‘stopping-over’ on these platforms. However, the majority are likely to go unrecorded if they arrive/depart from such installations during darkness, which is likely. Table 1 suggests that there was a one-day lag between the main arrival of migrant birds into coastal Norfolk (on 25th August) and migrant bats (on 26th August). Birds are known to be able to complete long-distance single flights and the main arrival in advance of the main arrival of bats over these dates might be explained by bats stopping-over on offshore installations for one night during their North Sea crossings. It appears likely that a combination of ideal weather conditions, Bank Holiday weekend observer coverage and an increase in potential stop-over sites in the form of offshore installations were the predominant factors in this unprecedented influx of migrant bats into Norfolk in autumn 2013. I would encourage anyone with old records of migrating bats to submit them to the county mammal recorder/Norfolk Biodiversity Information Service (NBIS). Thanks go out to all the observers who sent in their records and to Jan Boshamer who kindly let me use his map of offshore installations in the North Sea (Figure 2). Thanks also to Alex Lees for looking over a draft of this piece. • Altringham, J.D (2011). Bats, From Evolution to Conservation (2nd eds). Oxford University Press. • Boshamer, J.P.C. & Piet Bekker, J.P. (2008). Nathusius’ Pipistrelle (Pipistrellus nathusii) and other species of bats on offshore platforms in the Dutch sector if the North Sea. Lutra 51 (1): 17-36. • Hedenstrom, A. (2009). Optimal migration strategies in bats. Journal of Mammalogy, 90 (6): 1298-1309. • Hutson, A.M. (1993). Action plan for the conservation of bats in the United Kingdom. London: Bat Conservation Trust. • Hutterer, R., Ivanova, T., Meyer-Cords, C. & Rodrigues, L. (2005). Bat migrations in Europe. A review of banding data and literature. Naturschultz und BiologischeViefalt 28. Federal Agency for Nature Conservation, Bonn. • Stebbings, R.E (1988). Conservation of European bats. Croom Helm, London. • Suba, J. (2014). Migrating Nathusius’ Pipistrelles optimise flight speed and maintain acoustic contact with the ground. Environmental and Experimental Biology 12: 7-14. • Suba, J, Petersons, G & Rydell, J. (2012) Fly-and-forage strategy in the bat Pipistrellus nathusii during autumn migration. Acta Chiropterologica, 14 (2): 379-385. The above article has been reproduced from the ‘Norfolk Bird and Mammal Report 2013’. Many thanks to the Norfolk and Norwich Naturalist’ Society for allowing this. Previous ArticleThe 2016 Norwich Garden Birds Year-list Challenge! Next ArticleWill the human race learn?